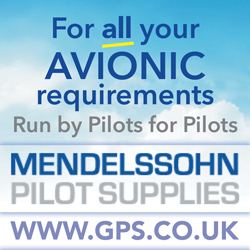 Is the weather preventing you from flying as much as you would like? Why not take the opportunity to mentally refine and rehearse your gliding skills? Good training meant that when G Dale was involved in a mid-air collision, he was able to automatically do the right thing and successfully bale out. Learn from his experience and discover how to train your brain in the February-March issue of S&G, which also includes top tips on owning and flying the K-6. G Dale has described 2012 as “a crap season”, where he landed out six times, but only had the glider with him on five of those occasions. He had two close calls, the first of which saw him risking a crash in unlandable terrain during the Flight Challenge Cup in Prievidza, Slovakia. The second was the mid-air collision on day two of the Club Class Nationals at Cambridge, where he survived baling out with just concussion. Good training played an important role in G automatically reacting in the correct way. Practising your gliding skills does not have to end when you climb out of the glider. Many of us tend to refine skills we are already good at and dislike practising things in which we are less proficient, but bad habits need more work and implementing a better course of action can be done quicker and more efficiently by employing mental rehearsal strategies. Bernard Eckey explains how to train your brain to better cope with situations when they next arise. 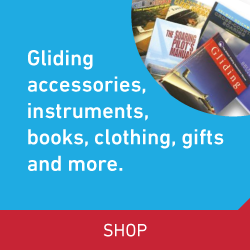 Thinking of buying a glider? The K-6 is a classic glider that is not only suitable for pilots at all levels of experience, but alsoaffordable as a personal or syndicate glider. It is well mannered, pleasant to fly and has enough performance for Silver, Gold and Diamond distance. Jason Hatton offers some practical advice on owning and flying the K-6 in the first of a two-part feature. 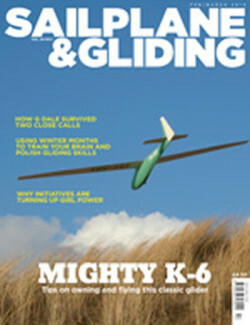 This issue also includes advice from Bruce Stephenson on what to look for if you would like to own a vintage glider. Liz Sparrow is the world’s number one woman glider pilot. With women making up just three per cent of UK club pilots, and even fewer comp pilots, the Women’s Development Initiative aims to encourage more women into competition flying. Liz talks about this initiative and how the Facebook page Women Glide (UK) is getting women pilots talking to each other. Claudia Hill and Helen Hingley are two pilots who have benefited from the Women’s Development Initiative. They describe how their experience has led to places in the British team for the 2013 Women’s World Championships. Also in this issue: Tony Segal owns up to an early morning SUMPAC adventure. Pete Stratten explains the importance of everyone understanding the issues before making a transition to EASA pilot licensing and also checks out Dynon’s D1 portable attitude indicator. Mike Fox looks at the different scenarios you might face when a winch launch fails. Senior pilots wander down memory lane with Mike Bird. Peter Carter finds out what juniors can achieve from two-seater training. Roger Coombs tells the story ofBanbury’s EuroFOX, from initial research and build to some very attractive launch fees for members. Alan Lapworth investigates the seasonal variation of the prevailing wind direction in Britain. Brian Spreckley reviews George Lee’s autobiography Hold Fast to Your Dreams. Tony Cronshaw reviews the third edition of Bernard Eckey’s Advanced Soaring Made Easy. Hugh Woodsend looks at recent Airprox trends. Flight Lieutenant Gareth Walker explains how the RAF is engaging with local airfields and glider sites to improve airspace safety. And there are more of your stunning images in the Gallery pages.